Use this template to organize and track candidates for all of your open roles so your team is aligned throughout the hiring process. Finding great talent is a lot of work. When you’re recruiting for multiple roles, it can quickly become difficult to manage the candidate pipeline and coordinate with internal hiring partners and external candidates. By using a template in Asana for candidate tracking, you can can see where each person stands in the hiring process, store important contact details, and capture interview notes. See all the details in one place. Interviewers need to come to interviews prepared, with the right information, so every candidate gets a consistent experience. By tracking all the details in one place, information dosen’t get scattered. Integrate with tools you love. Asana connects to lots of other recruiting tools you love so you can save time going back and forth, while making sure information in both places is accurate. Know which stage candidates are in. 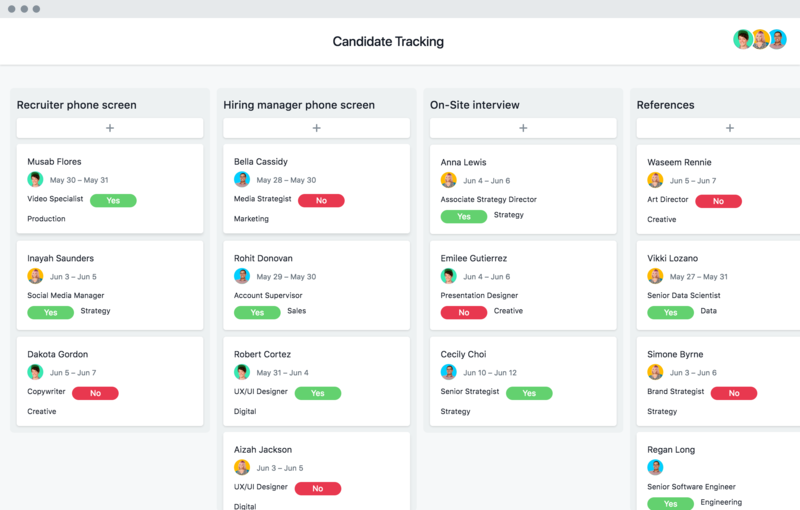 In a quick glance, you can sort your candidate tracking project to see where each candidate is in the process to ensure things are running smoothly and according to schedule. Hiring great talent is directly tied to your company’s success. Take the complexity out of the hiring process and create a seamless system to attract and hire the best candidates. Learn how Olo crafts the complete onboarding experience to create an excellent company culture. Give candidates a smooth experience by trying our tips to help you manage your template project. Improve your recruiting process with templates in Asana Premium—so you can hire great talent.